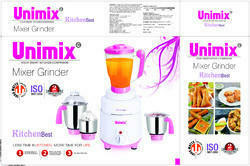 Manufacturer of a wide range of products which include electric 4 jar mixer grinder. We are consistently delivering a quality assured range of Electric 4 Jar Mixer Grinder. These products are used for reducing the food into small pieces. . Offered range of products are highly demanded by our valuable clients due to the excellent properties, precise designed and of best quality. These products are used by various industries to achieve the best results. We are providing these products at leading market price.